Social media is no longer an area of uncertainty, it is now viewed as an effective tool for business and has become an essential one that almost all companies should use daily. Not only for advertisements, but for communication and engagement equally. Consumers have become accustomed to a higher standard of company interaction that is now indispensable if you wish to compete at the highest level. Instagram has over 800 million active users and for most companies can be a great tool for engaging with existing and potential customers. Here are our top five tips on how to ace it on Instagram and create a following for your business. As a bonus we have added in an ‘action’ section for each tip which tells you exactly how you can apply your new-found knowledge! An essential tip for gaining an audience is to be consistent and frequent with your posts. Frequent exposure to your content is more likely to engage your followers and result in them having a stronger association with your brand. ACTION: Create a content plan that will include when and how much you will post. Make sure your posts are spread out across the week and aim to post at least around 4/5 times. Another way of phrasing Gary Varnerchuk’s ‘Jab, Jab, Right Hook’, this tip refers to the strategy of not trying to oversell through your social media channels. Your content should be useful and engaging for your target audience, not just constantly bombarding them with hard sales messages. Try and aim for only one in three posts to be specifically directing consumers to your product or service. The rest can include anything that will bring value to your audience. For example; trends in your industry, reposts from influencers using your product, or even videos behind the scenes of the production process. ACTION: Split your content plan into two sections; content that is aiming to convert consumers into customers and content that is aiming to bring value to your target audience. Make sure there is significantly more in the latter section. There is no point working hard to build a large following if they aren’t going to stick around. Liking every comment, answering every question, reposting their content; these are all great examples of actions you can take to retain your followers through engagement. Acknowledging and interacting with them will also make your company feel more human, which can have a massive positive impact on brand image. Action: Pick a day and time in the week and dedicate 30 minutes to going back through your posts and replying to or liking every comment left on your pictures. Direct messaging is a quick and easy way for customers to get in touch, ensure that you are responding promptly to these in order to keep customers satisfied. Doing this will encourage them to interact with your content, making them more likely to be long term followers and customers. Nowadays, there is absolutely no excuse for posting bad quality pictures. Competition for people’s attention is so high, that it becomes extremely difficult to capture it if your content is of an inferior standard. It can also negatively impact the business’ brand image, as people will start to associate it with a low standard of quality. Ensure your online presence represents the level of quality you want your customers to associate your brand with, by using high quality, well edited media. Action: Search through your favourite/successful companies Instagram pages and find 3 pieces of content that really stand out to you. Assess their quality and effectiveness then use them as markers to compare to your original content. Do not start releasing content until you feel it is of a similar standard, however, be realistic. Remember some of these companies will have whole teams and tons of professional equipment working to create their stuff. Don’t be too harsh on yourself but remember there are a lot of great apps out there that can help you create some great looking pictures for free! NO.5: Put yourself out there, get seen! Use hashtags # – This is probably the easiest of the 3. Using hashtags that you know your target market are using opens you up to whole load of potential customers. Make sure they aren’t too general to avoid getting lost in the crowd. Collaborate – Find other pages with audiences that fit inside your target market and find some way to collaborate with them. This could be through paid promotion or even a deal whereby you both shout each other out for free. Find some way to bring value to them in order to get access to their audience’s attention. Influencers – Search for people with large followings who can promote your product and whose following consists of people that are likely to purchase your product or service. This may come at a price but view it as an investment that will hopefully pay off as many companies have had great success through utilising the power of influencers. ACTION: Make sure to use at least 3 relevant hashtags on each post. After doing research, write down a list of big pages or influencers that you would like to work with, include this in your content plan. Set a budget for how much you would like to spend and start to reach out to people in your list and seek collaborations. And that’s it! 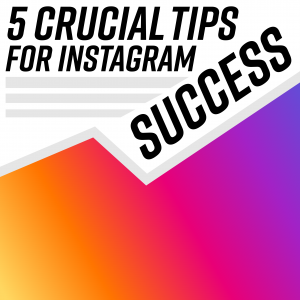 Our five crucial tips for Instagram success to get your business started on its social media journey! If you feel you need further support on gaining online exposure for your business enter your details below and a member of the Shout Out Wales team will get in contact to see how we can help. Our directory is exclusively for businesses in wales and has several different plans to help yours reach success online!